Pelvic lymph node metastases are an adverse prognostic factor in patients with urothelial carcinoma of the bladder. Nonetheless, a substantial percentage of these patients will exhibit a clinical response to chemotherapy, with resolution of lymphadenopathy on post-chemotherapy imaging studies. The management of these patients is complex, as many will have persistent micrometastatic disease at the time of radical cystectomy despite an apparent response to chemotherapy, illustrating the limitations of our current imaging modalities. Furthermore, the rate of response to chemotherapy for pelvic lymph node metastases may differ from the response rate of primary tumors, and the response to chemotherapy is highly variable among individuals. The role of radical cystectomy in this setting remains unclear. 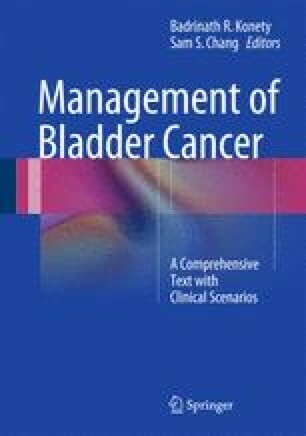 The literature suggests that pathological evaluation of the bladder and regional lymph nodes after radical cystectomy is the only way to truly assess response to chemotherapy. Thus, surgery is the most effective manner of staging these patients, and pathology after radical cystectomy is strongly correlated with patient prognosis. However, the independent contribution of surgery, above and beyond that of chemotherapy, in improving survival for patients with pelvic nodal metastases remains unclear.